I Do Not Permit A Woman To Teach! Recently, after coming back from a mission trip, a friend of mine, a dental school student, wrote the following article. Over this last break, I made the executive decision to go on a mission trip to one of the poorest nations in the world. I would love to use prettier adjectives to describe my decision for going. Adjective such as: ‘wonderful opportunity’ or ‘blessed chance’, but in reality, I just saw a flier and signed up. I went overseas with the idea that I was going to help as many people as humanly possible. The morning after we arrived, I and about 20 other students excitedly got on a bus that would be our means of transportation for the following 5 days. The first order of business was to introduce ourselves to our peers, when it quickly became apparent to me that not everyone had the same intentions for coming on the trip. On the bus ride I heard several variations of, ”I am about to start student clinic and I want to get better at drilling teeth”, which immediately sent me back to a conversation I had weeks before my departure. ”Why do you think the students are sent to these countries for mission trips?’ I thought I knew the answer—these are poor and impoverished nations that need our help. Then, why not go to poor and impoverished areas in America, and serve there?’ We ALL knew the answer to that question, IT IS ILLEGAL FOR THE STUDENTS TO DRILL UNSUPERVISED AT THIS POINT OF OUR DENTESTERY CAREER. For most of the journey we were unsupervised. There were some licensed dentists on the trip. None had brought their tools of the trades with them, and our leader spent the majority of the days in the comfort of our air-conditioned bus because ”the heat exhausts [him].” If a student had a question, they were advised to seek out the help of other students. 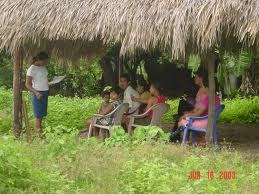 The mission trip became student-training ground. Where else would we have had the opportunity to drill 60, 70, 100 people in a week at our skill level? Never in the United States of America! HOWEVER, in this third world nation, we’re encouraged to practice on any type of dental problem that we weren’t confident in—regardless of its necessity. The second night on the trip, one of the doctors told the students, ”If you aren’t proficient in any type of drilling, just decide this in your head now, tomorrow, I am going to perform that technique on everyone. Every person who lays on your chair will get that treatment.” WHAT?!? I felt sick to my stomach. I immediately stood up and walked out of the meeting room. How should we respond to a group of dental students who’re going to practice their drilling technique on third world children? Their skin color might be different, and their language may be foreign, but they are still human beings. I don’t think the students should be held liable for their attitudes. We are encouraged to go on these trips to get better—to practice on these trusting people. The students come back from these overseas trips very encouraged by all they learned, and all the ”good“ they did. But in reality, these trips are monetarily profiting those who put it together. That is why, regardless of your level in school or your competency, if your check clears, you are qualified to go on a mission trip. Let me leave you with the following proposal. For the next mission trip, I challenge you to give it a second, third, fourth thought before you choose to sign-up. If a pre-requisite for the mission trip were to drill holes in everyone’s tooth in your class, would you be confident and competent enough to do so? If you were handed your infant niece or nephew, would you be able to analyze their problem and drill their teeth properly? Are your fellow peers lining up to have you fix their teeth? If not, then you probably are not ready to serve as a dentist on a mission trip. So, what does drilling teeth have to do with Apostle Paul’s admonition, “I do not permit a woman to teach or to assume authority over a man…”? Isn’t in interesting that many Christian denominations who are strictly against women in authority over men, often have no problem sending the same women overseas to become teachers to non-American males? And even worse, frequently, these ladies are sent out unqualified or unprepared because they just want to get away from their families, their pastors want them away from the church, or their checks cleared. Pastor, if you’re not willing to let these ladies teach your fathers, brothers, sons, or other male members of your church, isn’t it hypocritical to have them teach other males? Don’t these third world males deserve to receive the true teachings of the Bible, which, according to you, can only be communicated by other males? Or, are you telling me only the Westerners deserve the proper teachings of the Word and the rest of us should be happy and honored with the crumbs we might receive under the table?